We’re pretty lucky at Union Room in that we get to work with some interesting and diverse clients. No matter the business sector we are always focused on producing excellent web design and development. 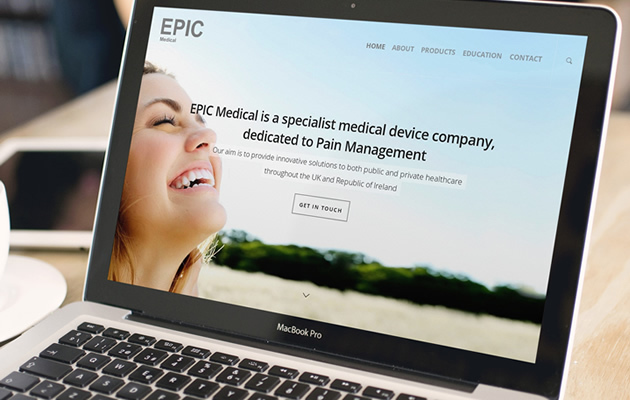 EPIC Medical Limited is a medical device distribution company based in the North East of England dedicated to Pain Management. They exclusively distribute products for Epimed throughout the UK and the Republic of Ireland. Union Room were commissioned to build them a new responsive website to provide the business with a professional online presence to grow and develop with their business model. Working with Steph and Doug we have launched the new website to clearly communicate their products, the specifications for these and allow people to easily get in touch to find out more information. Powered by WordPress the team can easily update and manage the content throughout the admin panels within. We will also be looking at how the website can grow (they are launching a blog very soon) and how EPIC Medical can promote themselves via search engines and email marketing over the coming months. Perhaps its time you had a more professional looking website or you need to redesign your existing website? Whatever your web design or digital marketing requirements we’d love you to get in touch so we can discuss in more detail.